Recognizing increased demand in the lighting marketplace, 1000Bulbs.com recently announced the addition of automotive lighting to its online offering. Though the company previously offered an array of miniature indicator bulbs, including brake lights and turn signal bulbs, the new offering includes a variety of headlight capsules and fog lamps all organized in an easy-to-navigate category page. Jeremy Foster, director of marketing at 1000Bulbs.com, admits that automotive lighting had been only a hobby for the company in the past. "We had just about every type of bulb imaginable, but automotive bulbs never got the attention they deserved," says Foster. Now, the website boasts nearly 30 new bulbs, not including previously offered indicator lamps, which number in the hundreds. The new bulbs span 10 categories, each customized to reflect the bulb's application. 1000Bulbs.com gives special representation to headlight bulbs, with half the new offerings falling into this category. The collection includes halogen and xenon capsules that range from affordable brands like Eiko to premium offerings from Sylvania. Fog lights and sealed beam lamps round out the new collection with similar brand representation. 1000Bulbs.com also reemphasized the automotive applications of the previously mentioned miniature indicator lamps. Until now, the company's website had emphasized the bulbs for non-automotive applications in commercial settings. Though the majority of these bulbs will still sell in 10-packs, the company has kept prices low to appeal to residential users and small body and repair shops. Mr. Foster says to expect more growth within the category over the next quarter as the company receives customer feedback. Plans for expansion include a wider selection of bulbs to match all car makes and models and LED versions of popular indicator lamps. 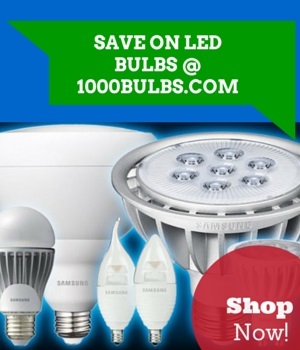 1000Bulbs.com is an award-winning Internet-based lighting retailer. The company offers everything from simple, household light bulbs to cutting-edge specialty lighting systems. Nationally recognized for growth, innovation, and customer satisfaction, 1000Bulbs.com is an influential force in the lighting industry.